We saw that pregnant sows on Heather’s farm live in private gestation stalls. Heather and her family keep excellent records of when each sow was bred, and when their due date is. Did you know that pigs are pregnant for 3 months, 3 weeks, and 3 days? Then she farrows, or gives birth to her litter of piglets. The Monday before the sow’s due date, she is moved into the farrowing barn, where she also gets her own private stall. Here is a sow in a farrowing stall with her new litter of piglets. The farrowing barn is kept relatively cool, around 70 degrees all year. The sows are more comfortable at this temperature. However, the piglets (like most baby animals) need to be a little warmer than their moms. The piglets have an area with a heat lamp – they can stay under the heat lamp when they get a little cool, and they have space where they can be out from under the heat lamp if they get too warm. The photo above was taken on Heather’s farm a few months ago. Their farrowing barn is empty right now so they can do some deep-cleaning and replace the floor. 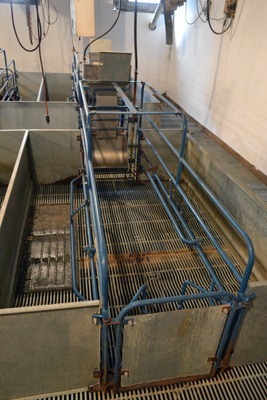 The photo below is an empty farrowing stall. You can see that the sow has plenty of room in the middle section. Just like in the gestation stalls, she can get up, lie down, and she can move back and forth and side to side. There’s not quite enough space for her to turn around, but this keeps her from urinating and defecating in her food and water. The piglets have their own space on either side of the mom. They can move from side to side, and have a safe place to be when the sow lies down or gets up. Sows weigh between 350-400 pounds, and are not the most graceful animals. They have relatively short legs for their bodies, and they don’t have much control over where they lay down once they start. Without a place for the piglets to get away from the sows, they can be crushed underneath her when she lays down. Each farrowing stall has its own food and water system. In the farrowing barn, each sow is fed by hand, twice a day. She has access to water all the time through the nozzle to the right of the feeder. 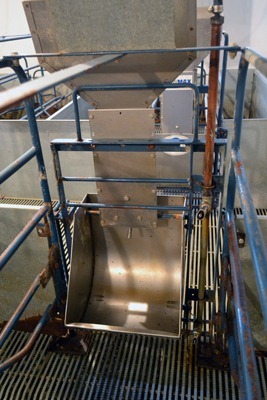 This is the front of the feeder, where the feed is delivered to each sow. Each feeder also has a clipboard, where the sow’s information and medical records are kept. Each sow has her own medical record in a computer system, and a summary of this record is printed out and kept on her stall. It includes information about her previous litters, any medications she was or is on, and information about the current litter of piglets. 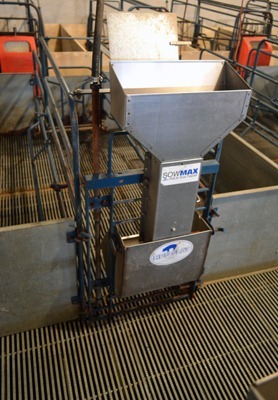 Cleanliness and biosecurity is very important on any pig farm. Pigs are susceptible to many of the same diseases that people are (like influenza), so it is important to limit the number of people who have interaction with the pigs. It is also very easy for diseases to spread quickly between pigs, so it is important to try to keep the pigs as healthy as they can be. Some diseases that affect pigs can even be carried on your clothes or shoes between pig farms! When I visited Heather’s farm, I wore coveralls over my clothes and shoe covers over my boots to minimize the chance that I would make any of their pigs sick. If I had been on another pig farm in the last 48 hours, Heather would not have let me into her barns. This helps to protect the health of her pigs. Cleaning between groups of pigs is very important. Every time a pig moves out of one stall (like from the gestation barn to the farrowing barn), the stall and all the equipment (feed trough and water spout) are cleaned and disinfected before another pig goes into the stall. Think about the last time you moved into a new home – how much time did you spend cleaning before you unpacked and called it your own? It’s the same for pigs. We want them to have a clean, healthy place to live. Right now, Heather’s farrowing barn is completely empty. They are getting ready to replace the flooring (which can’t be done with any pigs in the barn). Once the floors are replaced, they will do a deep-cleaning and disinfecting so it’s clean and ready for the pigs to come back. Next up? The piglets, of course! Nice! Thank you for the details! Even though the gestation crate issue has been getting a lot of attention and I’ve been trying to follow it for work and for personal interest, you are the first person to point out why the gestation crates don’t allow the sows to turn around. Preventing them from messing up their food and water makes a great deal of sense and I wonder why that detail isn’t brought up more. I recently got to hear Dr. Temple Grandin speak at a conference and someone asked about crates for pigs, conflating the gestation and the farrowing crates for sows. Grandin made a big point that they are very different and voiced her opinion that while gestation crates might die on the alter of public sentiment (my rendition, not hers), farrowing crates would likely be safe because they serve to protect the piglets and that’s not something the public would demand be done away with. I wonder though if — should the gestation crates fall out of favor in the consumer mindset — negative attention would then turn to farrowing crates for their similar “inhumane” nature of preventing the sows from turning around, which seems to be a big sticking point against gestation crates in the current dialog. Any thoughts on this? Did your friend Heather mention any concern over the future of her management practices from public pressures? Kerry – You’re right in that gestation stalls have been the big targets. I suspect that farrowing stalls will see similar criticism in the future. 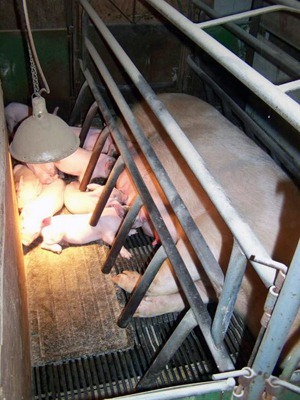 Yes, one of the big reasons for farrowing stalls is to protect the piglets. But I think a lot of people think sows have a “mothering instinct” that will keep them from lying on their piglets and crushing them. Unfortunately, when a 400-pound sow decides to lay down, there’s not a whole lot of control, and piglets in her path will be crushed. I expect, because of misunderstandings of these types of housing, farrowing stalls will eventually be facing the same issues that gestation stalls are facing now. Yes, Heather and many other pig farmers are concerned about the financial ramifications of converting their current gestation stall barns into group pen housing, or having to build new buildings and abandon the current ones. It’s going to be a big issue and is going to involve a lot of financial investment on the farmer’s part. Chances are that many pig farmers will go out of business if they are required to change over to group pen housing.